It reduces the loss of water due to seepage and hence the duty is enhanced. It controls the water logging and hence the bad effects of water-logging are eliminated. It provides smooth surface and hence the velocity of flow can be increased. Due to the increased velocity the discharge capacity of a canal is also increased. Due to the increased velocity, the evaporation loss also can be reduced. 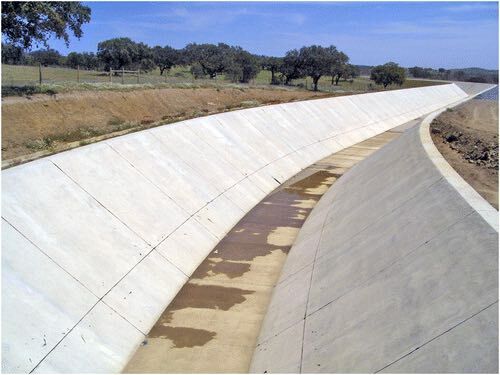 The increased velocity eliminates the possibility of silting in the canal bed. It controls the growth of weeds along the canal sides and bed. It provides the stable section of the canal. It reduces the requirements of land width for the canal, because smaller section of the canal can be used to produce greater discharge. It prevents the sub-soil salt to come in contact with the canal water. 12. It reduces the maintenance cost for the canals. The initial cost of the canal lining is very high. So, it makes the project very expensive with respect to the output. It involves many difficulties for repairing the damaged section of lining. It takes too much time to complete the project work. It becomes difficult, if the outlets are required to be shifted or new outlets are required to be provided, because the dismantling of the lined section is difficult.